After the title's debate on a non-Playstation platform in Chain of Memories, Kingdom Hearts II brings the series back to its original home of the Playstation 2. As to be expected the basic controls are similar to the original's for the most past, providing a familiar if renovated feel compared with the first installment. That is hardly to say the two systems are the same or even all that similar in what they offer, as Kingdom Hearts IImade a noticeable effort of raising the number of ways in which a player can fight through the game. The basic controls seem to follow the design of Kingdom Hearts. The left analog stick is reserved for movement. The D-Pad is in charge of the command menu while X is for attacking and selecting, O is for jumping and cancelling a selection, and ■ is used for different menu operations as well as special mid-combat abilities. The first difference is with the right analog stick. While in Kingdom Hearts the right analog stick copied the D-Pad's functionality, in Kingdom Hearts II is used to control the camera, giving better control over the view point in more dimensions. The most noticeable difference from Kingdom Hearts remains with the ▲ button receiving quite a bit of importance both in-battle and during regular play. Starting in Kingdom Hearts II is a system called the Reaction Commands, a set of "pop-up" commands that become available at different times in the game. For instance, talking to an NPC or opening a chest no longer replace the menu's "Attack" command like it did in the first game, but instead those commands appear above the menu when the player approaches the chest or person he wishes to talk to. The Reaction Commands also appear in the midst of battle and often save the player from what otherwise would've been deadly situations. Almost all the enemies in the game have unique Reaction Commands exclusive to them, and some bosses can only be beaten by properly activating their Reaction Commands. Beyond the "how", the gameplay's "what" was expanded in this installment. The command menu has doubled in size and now consists of two four-slot lists, offering various new combat methods along with the familiar ones. The attack command and magic sub-menu remained, along with the Summon option which now has a new rooster Sora can call upon for help. How the Summoned ally behaves in combat changed, however, and is closer in nature to the newly introduced Limit system. 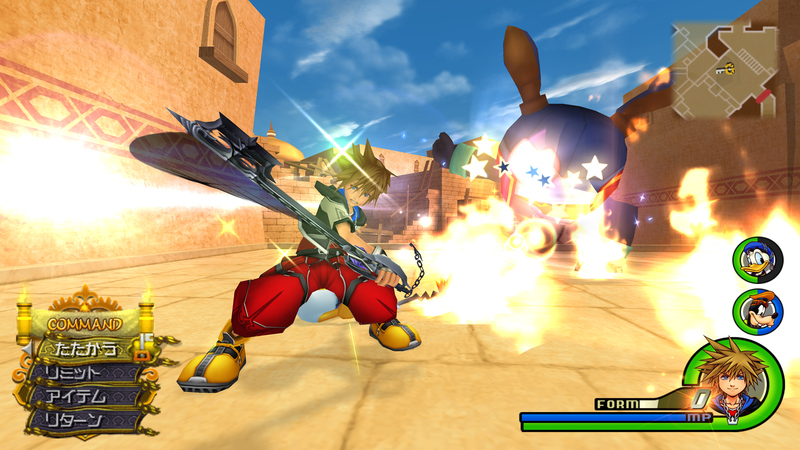 The Limit system utilizes the basic party structure and lets Sora use powerful combo attacks with a specific party member. Each party member as well as the Summoned allies has their own unique Limit ability; the only exception is the Trinity Limit technique Sora can use on his own for the not-so-rare occasion in which he needs to fight on his lonesome. Limit techniques replace the Attack command at times and offer a Reaction command. When the Limit gauge fills up an ultimate finishing move is unleashed, dealing heavy damage before ending the Limit. Regular Limits can only be used when Sora has remaining MP, but Summon Limits can be used more freely so long as the Summoned ally is still present. 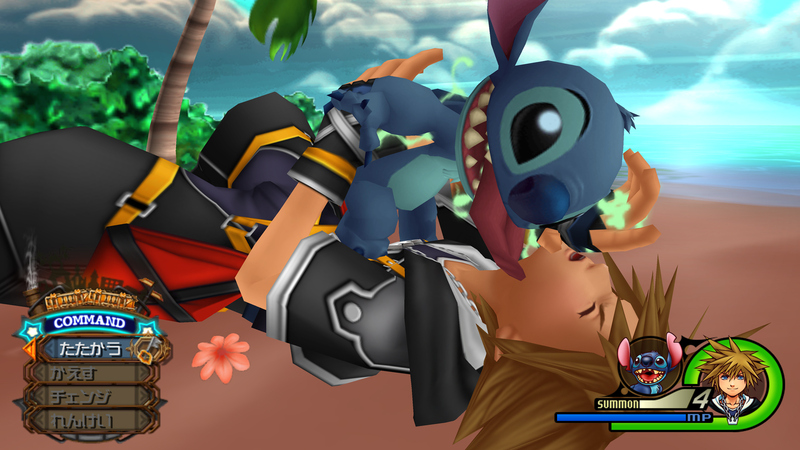 The party is not the only place Sora receives help from. More than once an "independent" character joins the fight, separate from the playable party. Depending on who joins they might hurt the party as well, but will always help them at least somewhat by attacking their enemies. The most unique and notice-worthy of this bunch is Mickey, who appears during selected boss fights should the party fall. 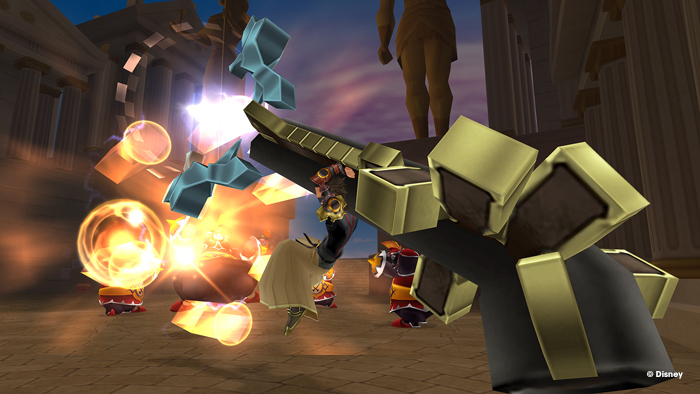 A choice is presented to the player and should he choose to Not Give Up, Mickey appears as a playable party-replacement. While he is able to deal damage he is incapable of dealing finishing blows. The only way to end a fight is for Mickey to use a special Reaction command to fill up a gauge. Once three bars are filled, Mickey revives the party and then takes his leave. The chance of being saved by Mickey lowers each time he appears in battle, though it starts with a reassuring 100% on the first defeat. On the matter of defeat there is another thing to note, being that Sora's HP depleting isn't the only way in which a Game Over occurs. Certain missions and conditions are set on various occasions, such as protecting an 'independent' party member or defeating a given group of enemies within a limited timeframe. Should the time run out before the enemies do, or if the protected character runs out of HP, it's Game Over. About the biggest difference in gameplay from Kingdom Hearts is the Drive system. 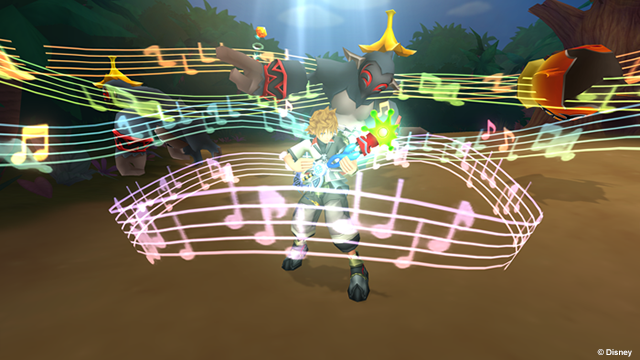 Given new, magical clothes, Sora gains the ability to tap into his full potential. Depending on which form he transforms into using the clothes his stats and abilities change, giving focus to one or more aspects such as his physical or magical abilities. 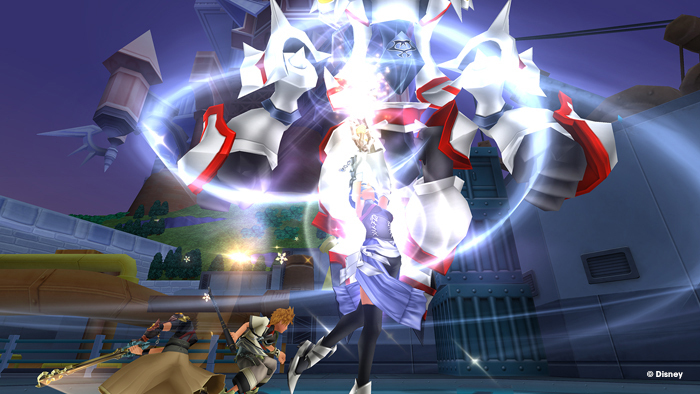 In order to change into a Form, Sora must "sacrifice" one or more party members during gameplay (they appear in any scene Sora enters while in a Form). Most forms are obtained as the game progresses, but two special forms are obtained randomly and only once certain plot events took place. 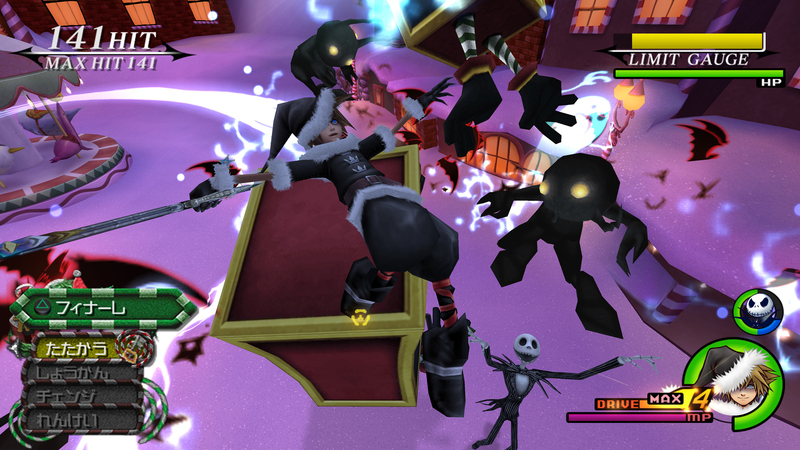 Overall, it's hard to say the gameplay remained too close to the original system introduced in Kingdom Hearts. However, it still retains much of its original charm and fluidity and seems to have simply grown up along with its main character, and is true to his growth as a warrior and a friend.